Many mobile artists prefer using a stylus over the finger when painting, and there are ready-made options like the Pogo Stylus or the mi-stylus. They do work fine, still they don’t feel very much like a painting tool in your hand. You simply use the softer part (not the dark scratchy stuff). In this case, I cut off a part of it, rolled it tightly and put it into a Koh-I-Noor lead holder. That’s it, works great, you just need to keep in mind: in order to register the touch, the tip needs to have a minimum size, approx. 0.5cm in a square. This entry was posted on Wednesday, June 2nd, 2010 at 15:09and is filed under . You can follow any responses to this entry through the RSS 2.0 feed. You can leave a response, or trackback from your own site. I’ve made some for myself using some long charcoal holders, so I can hold the brush way back getting that “real painting” feel. I also use an adjustable copy stand so the iPad is almost upright. I love my new digital canvas! 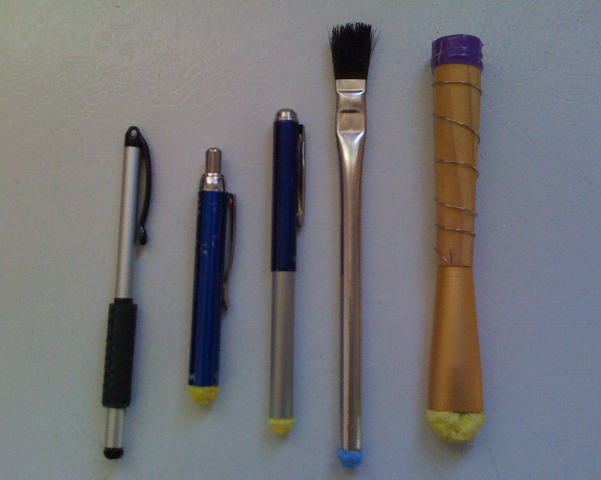 If your drawing / painting device has a non-conductive handle (plastic and some wood) wrap conductive wire up it like I did in the far right brush in the photo Benjamin posted. Do the tips need to be dipped into salty water to work? I’ve tried this but to no avail. I couldn’t find the exact same sponge brand, but it is a natural sponge and looks very similar. Sweet! I’m gonna make one this weekend! iLKke – the only household sponges I have found to work are those made by 3M, specifically the Scotch Brite brand. Both the yellow multipurpose and the blue heavy duty work. It needs to be a conductive sponge or foam. The foam that computer chips come in work too. This material is not the same as the packing sponge/foam that computer parts come in. Wow this works better than my pogo! Now I feel like goose for buying one. ILKke, is your sponge soft? When I first used the kitchen sponge it was soft out of the pack, but I rinsed off the stuff that was coating it in tap water, wrung it out in paper towels, and used it and it was amazing. But eventually it dried all the way out, hard, and didn’t work anymore. Moistening it in tap water made it soft and working again. I then remade it using sponge right out if the pack without rinsing it and it worked from the start (but not quite as soft as the damp one). So if your sponge is hard (all natural sponge I have found in shops is) then moistening with regular tap water (and then removing as much water as possible) could help? But you may need to keep doing it to keep it working. Tor: I have not allowed my sponge tips to get wet. They have been used for nearly two weeks now and are all still soft, pliable and work on my iPad. Sponges that I use for cleaning do get hard and do not work on the iPad, so apparently the coating is a good thing and you do not want to wash it off. Over long periods of disuse (unuse?) it’s probably a good idea to put your homemade styli in plastic bags. The original sponges come in them, probably to keep them fresher. Yeah, I tried moistening the sponge and sometimes it registers, but it’s far from usable. Yeah I washed it that first time cos sponges right out of the pack kinda creep me out. Weird I know LOL but the one I am using now us unwashed and lovely. If it does end up faking over time I’ll just pop in a new bit of sponge into the lead holder, and keep a bunch of sponge-bits in a plastic bag rather than the stylus itself. The sponge is cheaper and easier to find than the Koh-I-Nor. I’m not in the US but I used the cheapest no-name sponge in the supermarket, because that’s what I had on hand. No fancy brand names. No scouring pad to cut off. Worked great. I find with my Pogo I have to press hard for it to register but the regular kitchen sponge is much more responsive and just gorgeous to use, on iPad or iPhone. Still experimenting to see what method producec the most pleasant tip. Haven’t given up on sponges yet, as the foam seems to flake with use. Btw, when you want to zoom in/out, and are using the pen, just tap the thumb of the other hand on the screen and swipe with the pen! Thanks for the tip! 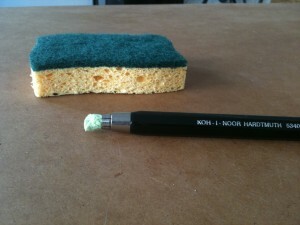 I just happened to have a new scotch brite sponge under the sink and it works great! I have a blue scotch brite pad which Ihacked up and voila!! annd it works on the macbook trackpad!